A solid marketing strategy is a key to successful business. Even the big companies understand it. They know that if they lay back and let things proceed at its pace, their sales will suffer. Also, they will have to work doubly hard to grab their market position. Being a marketer, you have to work hard to analyze, where you spend your time and dollars. If you have heard about success of magnet advertising, perhaps you might have got your answer. Today, you can easily select from a vast collection of customized magnets in rectangle and square shapes, circles, triangles, ovals, and customized shapes. However, that has not spelled doom for rectangle and square magnets in various sizes. Many marketers are still ordering them for building an impact. Customized 9.5 x 5 magnets are one of the popular sizes and this blog discusses why these magnets may allow you to set a solid marketing foundation with zero efforts. Customized magnets with 9.5 x 5 dimensions are indeed large and irresistible. People cannot ignore them at the upfront and they are sure to notice it over refrigerator doors or car doors. No wonder, many marketers are seeking it for announcing their business or sending invites for their corporate program or announcing sales, discounts, referral programs, etc. What is the expectation from a marketing strategy? Being a marketer, you would answer that the strategy you select should be able to offer you long term exposure and bring you quality leads. 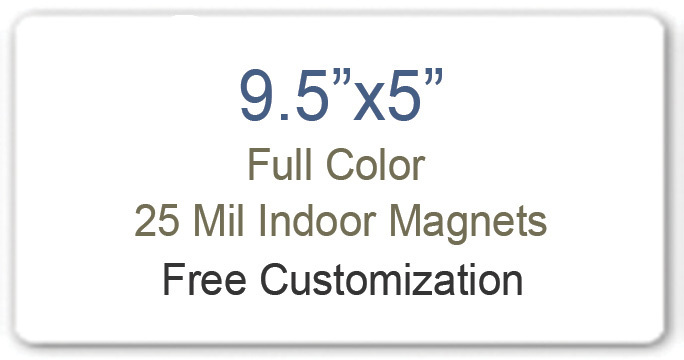 Promotional 9.5 x5 magnets allow marketers to stick business messages for long time in minds of their customers. At many eCommerce stores, you will find these advertising magnets in stock sizes 20 MIL, 25 MIL and 30 MIL. Perfect for making long term impressions with minimum investment! Who can forget the business information, which they see daily? Personalized magnets 9.5 x 5 can percolate deeply into the consciousness due to their largesse dimension and people would proudly retain them over their refrigerator doors or car doors. Any information printed over such large personalized magnets directly hit consciousness and it starts triggering positive buying decisions. There is rarely any other form of advertising, which offers great benefits than magnet advertising. Customized magnets 5 x9.5 are one such perfect promotional items, which come with baggage of goodies such as free art setup, free online design proof, free shipping and free full color printing ( only and only if you are purchasing it from a reputed eCommerce store stocking only made in USA magnets). Customized magnets are loveable, people retain them, and they stick well to any ferrous surface. Doesn’t that sound yummy? By now, you might have realized that there is hardly any other promotional item, which offer long-term benefit for one time investment. The above-mentioned points suggest why 9.5 x 5 magnets help to lay solid foundation for your brand. You can perhaps explore many other benefits, while working with it.